The Lionesses put in a very convincing, performance over Serbia and ran out deserved 7-0 winners. 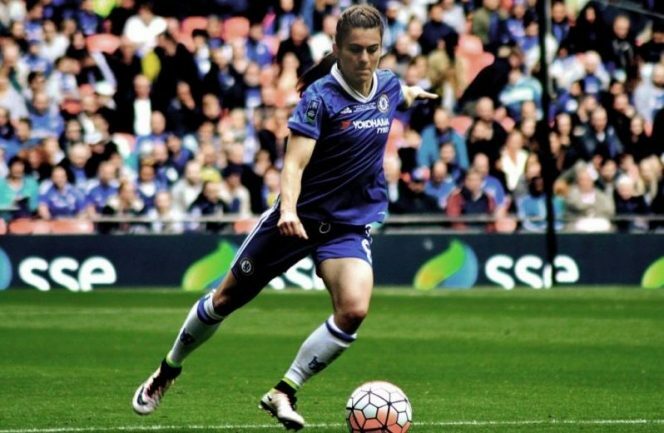 Karen Carney scored a hat-trick – although she admitted after the game that two of the goals she new little about – regardless Carney put in a powerful performance that earned her the player of the match. England played with a fluency and freedom that has been missing in recent games and there was a marked improvement in their passing which will, I am sure, please Mark Sampson. The other thing that has been missing is goals and tonight the crowd had plenty to cheer about. The team were spirited and hungry and were successful in winning the majority of the 50/50 balls; if they lost the ball then they worked to get it back and with the passion came an enjoyment which was also good to see. The other four goals came from four different players, with Alex Greenwood the one to score first. England having been threatening from kick off. Greenwood’s goal was struck from such a tight angle, the shot fooled the keeper and sailed into the far corner of the net. For all their pressure it was after the half hour mark before Karen Carney converted a rather soft penalty, much to the delight of the partisan crowd. Debutante Rachel Daly the next on the score sheet; she played very well and deserved a goal. The score was 3-0 at half time and in truth Serbia were lucky it wasn’t more. Their tactic of defending deep, very negative and clearly not successful, I only remember a couple of forays into the England penalty box but it was enough to see that they would have troubled England a lot more if they had pressed higher up the pitch and made the England defence work a little. You can only play what is in front of you and Sampson’s tactics were very successful as time and time again England found a way through the ten player defence to threaten goal. Ellen White crowned a fine performance with a cracking goal – the sheer joy on her face at scoring was great to see. From kick off England threatened again and this time it was Izzy Christiansen getting on the score sheet and taking the tally to 5-0. Karen Carney completed her hat-trick with strikes on the hour mark and then just three minutes later, it was difficult to see who had got the last touch but it was a rebound of Carney and into the net. England (4-1-2-1-2): 1 Karen Bardsley (Manchester City); 2 Lucy Bronze (Manchester City), 5 Steph Houghton (capt; Manchester City), 6 Laura Bassett (Notts County), 3 Alex Greenwood (Liverpool); 4 Fara Williams (Arsenal); 8 Jill Scott (Manchester City), 7 Isobel Christiansen (Manchester City); 10 Karen Carney (Chelsea); 9 Ellen White (Notts County), 11 Rachel Daly (Houston Dash). Serbia (4-4-2): 1 Susanna Nilsson; 2 Aleksandra Kozovic, 13 Marija Jonovic, 6 Nevena Damjanovic, 3 Tijana Krstic; 11 Vesna Smiljkovic (capt), 8 Marija Ilic, 4 Mirela Tenkov, 7 Allegra Poljak; 10 Jelena Cankovic, 9 Marija Radojicic. Substitutes: 18 Sanda Malesevic for Ilic (55), 16 Dina Blagojevic for Jonovic (67), 17 Olivera Markovic for Radojicic (89). Substitutes not used: 12 Milica Kostic, 5 Violeta Slovic, 14 Marijana Jankov, 15 Nikoleta Nikolic.